Our goal is to provide spectator seating solutions that fully meet the needs and vision of our customer. Whether its specialty seats for a VIP section, riser-mounted self-rising chairs or traditional grandstand seating, we offer a variety of seating options to best suit any venue. By coordinating with seat manufacturers like Interkal and Dant Clayton, we are able to integrate multiple seating solutions into our stadiums and grandstands. 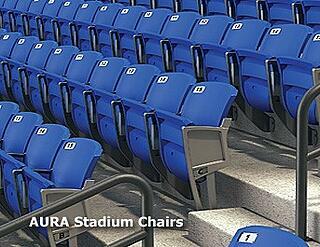 The AURA Stadium Chair is designed for ergonomic comfort and outstanding appearance. The AURA chair provides a strength and durability that can be counted on for many years to come. Available in Slat-back or Solid-back design for outdoor applications. Aluminum bench seating provides a more grandstand look and cost effective seating solution. We offer many styles & sizes, and our standard waterfall bench is recognized as the strongest and most comfortable in the bleacher industry. 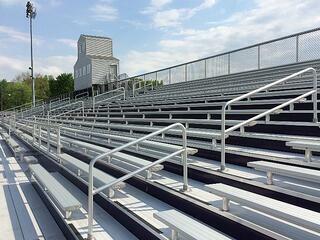 Our all-aluminum seating installs quickly, easily, and economically in permanent grandstands or bleachers. Seat boards come with cast end caps and a powder coated finish to enhance the overall look of the grandstand. Optional aluminum backrests are also available for the next level of spectator comfort.